In Austria solar thermal systems for hot water preparation and swimming pool heating faced a first boom period already in the 1980ies. At the beginning of the 1990ies it was possible to develop a considerable market in the field of solar combi systems for hot water and space heating. In the period between the year 2002 and 2009 the solar thermal market grew significantly and reached the peak in 2009 due to rising oil prices but also due to new applications in the multifamily house sector, the tourism sector as well as with new applications in solar assisted district heating and industrial process heat. After this phase of massive growths the sector is facing a declining market in theseventh year in a row. In the beginning of this development this was caused by the effects of economic and financial crisis but is now mainly influenced by the growing competition with photovoltaic systems, the increased use of heat pumps as well as the still low prices of fossil fuels. By the end of the year 2016 approx. 5.2 million m2 of solar thermal collectors were in operation. This corresponds to an installed thermal capacity of 3.6 GWth. The solar yield of the solar thermal systems in operation is equal to 2,130 GWhth. The avoided CO2-emissions are 426,473 tons. In 2016 a total of 111,930 m2 solar thermal collectors were installed, which corresponds to an installed thermal capacity of 78.4 MWth. 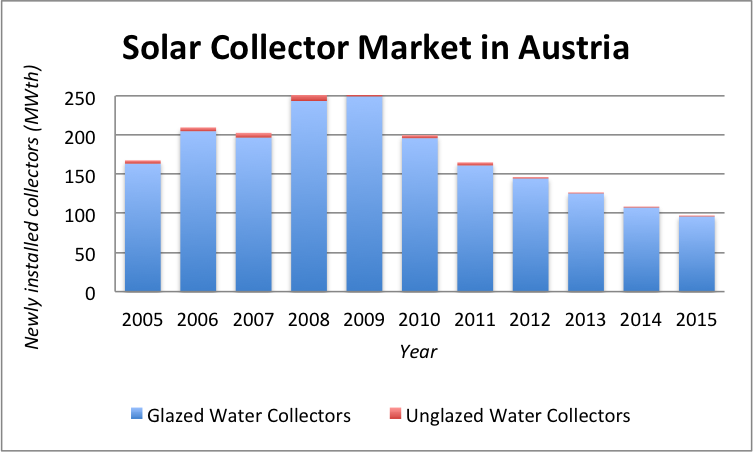 The development of the solar thermal collector market in Austria was characterized by a decrease of the sales figures of 19 % in 2016. The export rate of solar thermal collectors rose up to 83 %. The turnover of the Austrian solar thermal industry was estimated with 196 million Euros for the year 2016. Therefore approx. 1,600 full time jobs can be numbered in the solar thermal business. The Austrian solar thermal market is characterized by a broad diversification in terms of different applications. The applications range from domestic hot water systems and combi-systems for single family houses, which together covered about 70% of the market in 2016, medium-scale systems (50 - several hundred m² collector area) for multi-family houses, hospitals and hotels and large-scale systems (0.5 - 3 MWth) used for district heating and industrial process heat. Also a significant number of solar cooling and air-conditioning systems were installed. Swimming pool heating is as well an application, but with a rather small market share compared to the total. In 2016 a total of 111,930 m² (78.4 MWth) were installed in Austria. This collector area can be subdivided into 109,600 m² (76.7 MWth) flat-plate collectors, 1,440 m² (1 MWth) evacuated tube collectors, 760 m² (0.5 MWth) unglazed swimming pool absorbers and 130 m² (0.1 MWth) solar air collectors. The main market driver is still the environmental awareness of the population, but also subsidy schemes, which are in place in all provinces of Austria and also on federal level. For large-scale systems a special subsidy program has been in place since 2010 for systems in the range of 100 m² to 10,000 m² in the following fields of application: solar process heat, solar district heating, high solar fraction, new and innovative technologies. 14 Austrian manufacturers produced a collector area of 642,920 square meters in the year 2016. With this number, Austria is one of the leading European countries in solar thermal production. The export rate of solar thermal collectors was 83 % in 2016. The turnover of solar thermal industry is an estimated 196 million Euros for the year 2016. Approximately 1,600 full time jobs exist in the solar thermal business. The R&D programme "Building of Tomorrow Plus“ supports research and demonstration in order to achieve CO2 neutral buildings and plus energy buildings. According to IG Passivhaus approximately 16.000 housing-units exist in Austria. The general tendency goes to "Net-Zer-Energy" and "Plus-Energy" houses. More information about the passive house market in Europe you will find on www.passivehousedatabase.eu or for Austria www.igpassivhaus.at or www.passivhaus-austria.org. National and EU building regulations. The e!mission.at programme supports innovations that make a significant contribution to reducing the burden on the climate and increasing efficiency. The key goals in this context are to develop a sustainable energy system and to increase competitiveness by gaining a technological edge with national economic benefits. The focus of funding is on emerging technologies, energy efficiency and energy savings, renewable sources of energy, smart energy systems and storage. The Building of Tomorrow Plus programme focuses on energy-producing buildings of the future and energy efficient housing and was initiated by the Federal Ministry for Transport, Innovation and Technology (BMVIT). The programme is managed by the FFG in cooperation with Austria Business Service (AWS) and the Austrian Society for Environment and Technology (ÖGUT). Transnational energy research projects and activities carried out in cooperation with the International Energy Agency (IEA) are also funded via the BMVIT. The vision pursued by the “Smart Energy Demo-FIT for SET” programme is the first-ever implementation of a “smart city” or a “smart urban region” in Austria. Smart green technologies are being applied to turn cities and urban districts into “zero emission cities” and “sustainable urban regions”. The research and demonstration programme “Electromobility’s Technical Beacons” concentrates on sustainable mobility and energy supply and is geared to the strategic concerns and priorities of the Climate and Energy Fund. One of the main drivers is the Renewables Directive, which is a European Union directive which mandates levels of renewable energy use within the European Union. It was published on 23rd April 2009, its official title is 2009/28/EC. The directive requires EU member states to produce a pre-agreed proportion of energy consumption from renewable sources such that the EU as a whole shall obtain at least 20 % of total energy consumption from renewables by 2020. The Austrian national goal is to increase the share of renewables from 23.3 % to 34 % by 2020. All subsidy and support programs can be found at: www.solarwaerme.at/EFH/Foerderungen/.